The third edition of Ancient Greek Civilization is a concise, engaging introduction to the history and culture of ancient Greece from the Minoan civilization to the age of the Roman Empire. 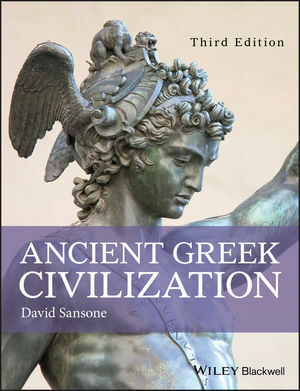 David Sansone is Professor Emeritus of Classics at the University of Illinois at Urbana-Champaign. He is a former editor of Illinois Classical Studies, served on the editorial boards of Classical Philology and Bryn Mawr Classical Review, and was a member of the Board of Directors of the American Philological Association. While his research focuses on Greek literature of the Classical Period, his publications include work on such subjects as textual criticism, theories of the origin of sport, Bronze Age iconography, John Milton, and Richard Wagner. He is the author of Greek Athletics and the Genesis of Sport (1988), Plutarch: Lives of Aristeides and Cato (1989), and Greek Drama and the Invention of Rhetoric (Wiley Blackwell, 2012).